Do you like coffee? Do you like naps? If you answered yes to both of those questions, you’re going to like what’s coming next. Research shows that combining the two – a coffee nap – is even better than each on its own. Coffee or a nap? Why not both!? There’s plenty of evidence for the health benefits of coffee (unless, like me, you’re allergic to caffeine!). Among other positive effects, drinking coffee may protect you against some nasty diseases and improve your memory. And of course, a major draw card for many people is the buzz that comes with a coffee. We’ve long known caffeine results in increased alertness: even one cup of coffee can make you feel more switched on. Caffeine can increase your alertness and reaction times when driving, reduce the number of mistakes you make at work, improve your mood, reduce mental and physical fatigue, improve athletic performance, and increase your ability to make the right decisions. No wonder caffeine is considered the world’s most popular and widely-used drug. Why is caffeine so effective at combating tiredness? Because a molecule called adenosine is what is making you feel tired. It’s a by-product of brain activity and it builds up during the day, making you feel worn out and drowsy. But caffeine blocks the adenosine from acting on your brain. So with caffeine in your system, you don’t feel the accumulating tiredness. Unfortunately, these benefits come with a cost. Drink a coffee too late in the day, and you’ll probably struggle to fall asleep. Caffeine consumed even six hours before you go to bed can interfere with both the quality and quantity of your sleep. As a result, many people recommend a 2 pm cut-off for drinking coffee. And the older you get, the more likely caffeine is going to disrupt your sleep. The message is clear: a coffee will perk you up, but be careful. Sleep is too important to mess around with. If you’ve ever thought of seeing how long you can stay awake for, please don’t. A lack of sleep, even over a short period, can have disastrous effects on your physical and mental health. Sleep deprivation will interfere with your memory, cause problems for your immune system, and at its most extreme, a lack of sleep could kill you. We’ve all heard napping is good for us – it’s one good way to fit a bit more shut eye into your day. Even a 10-minute nap can increase your ability to concentrate for up to four hours. And a six-minute nap can improve your memory. People who nap for at least half an hour three times a week have a significantly lower risk of suffering heart disease. A 40-minute nap taken during the work day improves the performance of both doctors and astronauts. Research shows that in the case of learning to do new tasks that rely on your powers of perception, a one-hour nap is just as good as a full night’s sleep in consolidating the new skills. 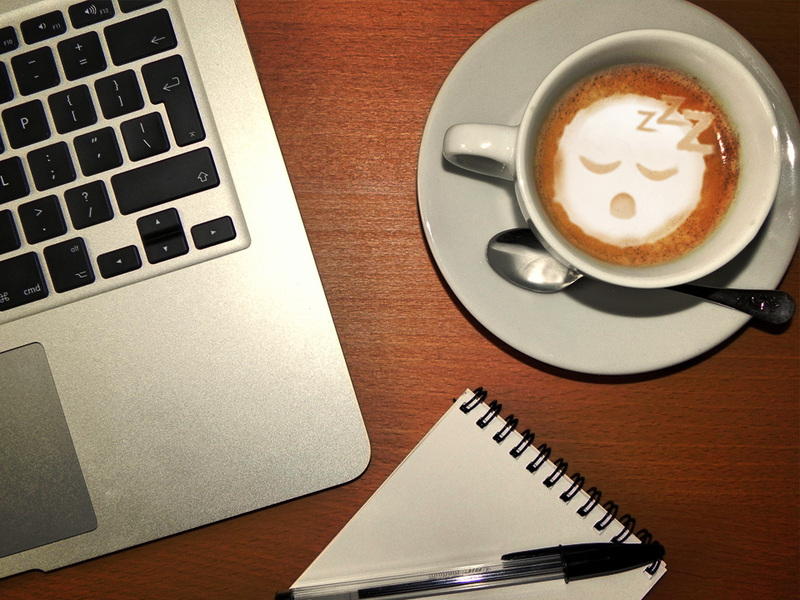 Separately, caffeine and napping can both work wonders for improving alertness, concentration and productivity. It may seem counterintuitive, but over the last 20 years, researchers have shown that putting the two together is in fact even more powerful. Enter the ‘coffee nap’. The idea is simple. Drink a coffee and then immediately lie down for a 15 – 20-minute nap. The timing is essential. And if you get the timing right, you get to reap the combined rewards of a nap and a caffeine buzz. This is because it takes about 20 minutes for the caffeine in your coffee to kick in and take effect. In one study, a caffeine nap improved driving performance and reduced sleepiness better than either a short nap without the coffee, cold air, or a strongly-brewed coffee without the nap. In another study, researchers found a coffee nap could reduce afternoon sleepiness in drivers by more than 90 percent. Even nappers who just dozed during their nap got the same alertness benefits as those who slept more deeply. In a Japanese study, a group of sleep-deprived people compared the benefits of five different approaches: a 20-minute nap, a coffee nap, being exposed to a very bright light immediately after napping, washing their face immediately after napping and resting, but not sleeping. In terms of how sleepy the study participants felt, and how successfully they were able to carry out cognition tests, the coffee nap won hands down. So you know what to do people. Fire up the coffee machine, then have a snooze and look forward to how great you’re going to feel once the caffeine kicks in. In 20 minutes, you’ll be leaping out of bed. Where has this idea been all my career? Coffee AND a nap?! That’s like lemon and sugar, Simon and Garfunkel, Ice Magic and…anything. ‘Sorry, I have to have my coffee nap now. Science told me to.’ The rest of my life is really looking up. Thanks Dr Martin! PS. Must admit, I quite enjoy staying awake after my coffee and wait in anticipation of that buzz, but in the name of science, I shall give this new method a go. My absolute pleasure Marti. So pleased to be of service 😉. Please report back and tell me how it goes. But, I buy a large Americano from Starbucks and it takes me 45 mins to finish it (I start drinking it 10 – 15 mins after buying). So Should I sleep after 45 mins (of buying coffee) but by then caffeine have already hit me. Next PostIs training your brain just a game?